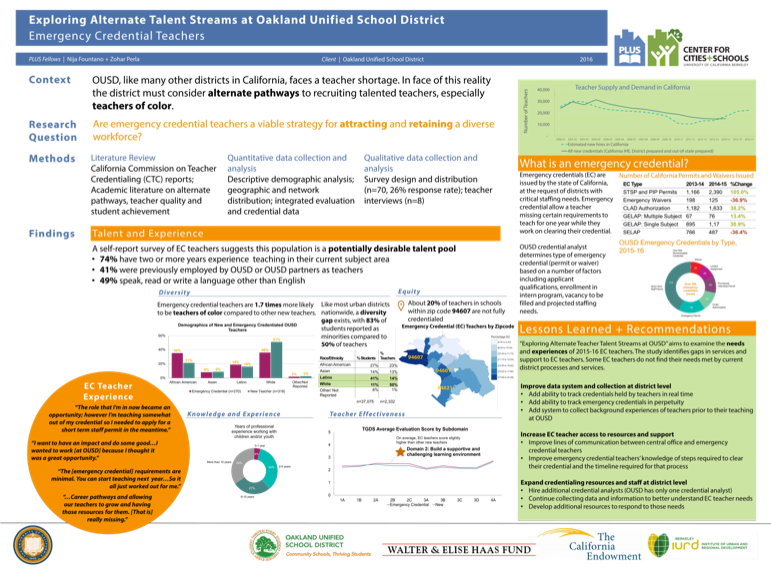 The Oakland Unified School District (OUSD), like many other districts in California and across the nation, has struggled to adequately fund the maintenance and operations (M&O) of its school facilities. 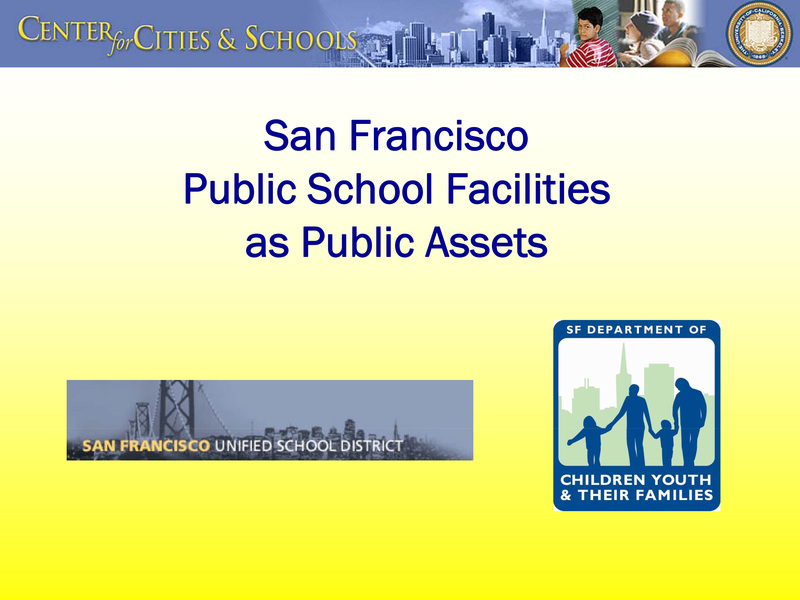 Properly maintaining and operating facilities is essential to ensuring the health and success of students and educators. 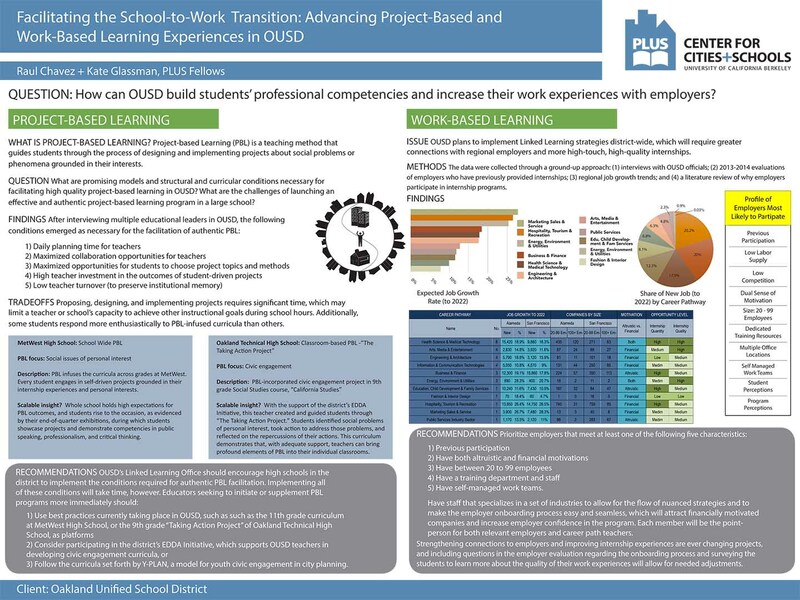 This project combines analysis of project-based learning (PBL) and work-based learning abilites to facilitate the school-to-work transition. 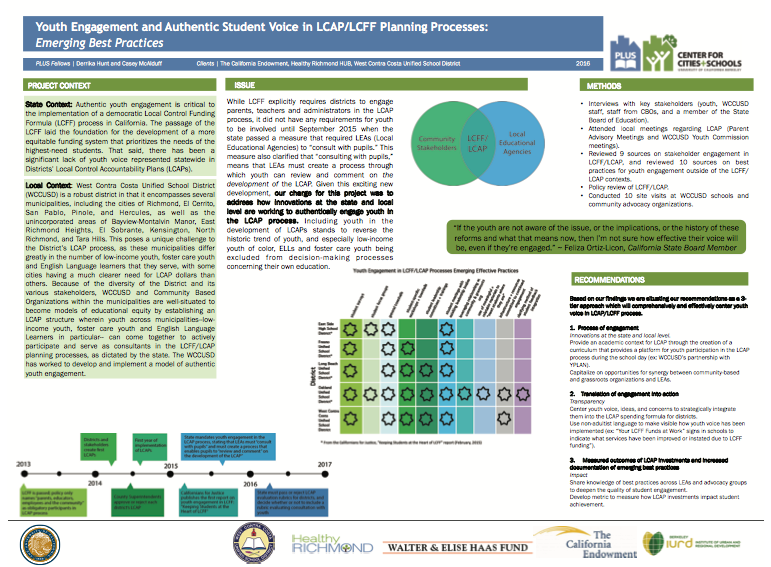 Project-based Learning (PBL) is a teaching method that guides students through the process of designing and implementing projects about social problems or phenomena grounded in their interests. 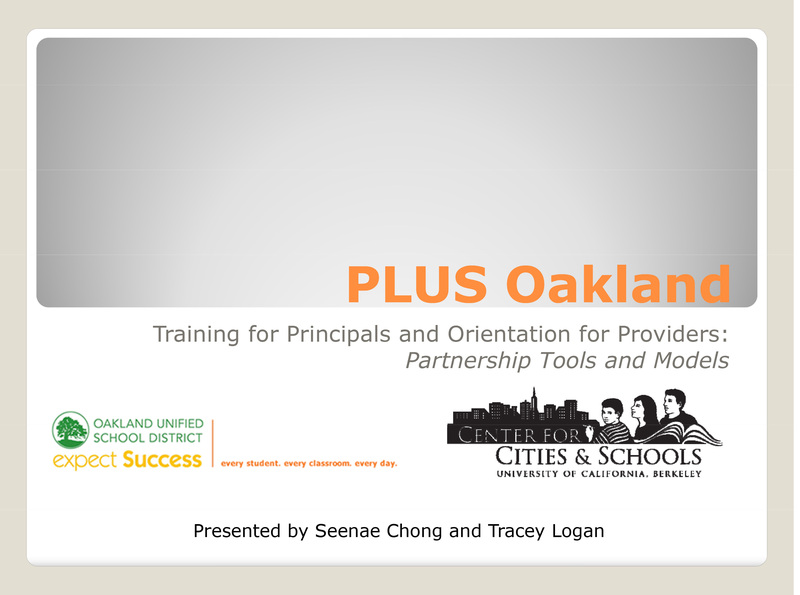 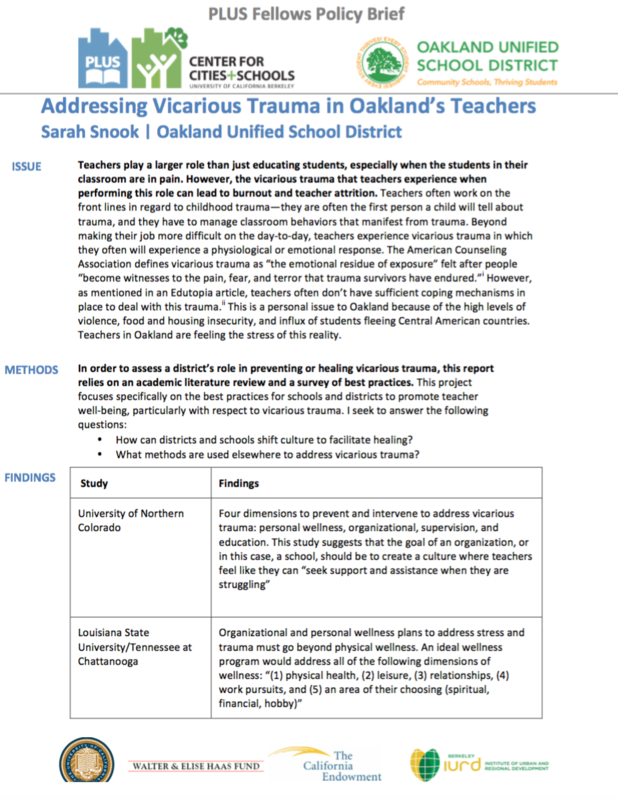 As a pedagogical approach, PBL fits well within the Oakland Unified School District’s Linked Learning academic framework, which prioritizes giving students opportunities to connect with professional communities and apply their learning outside of school. 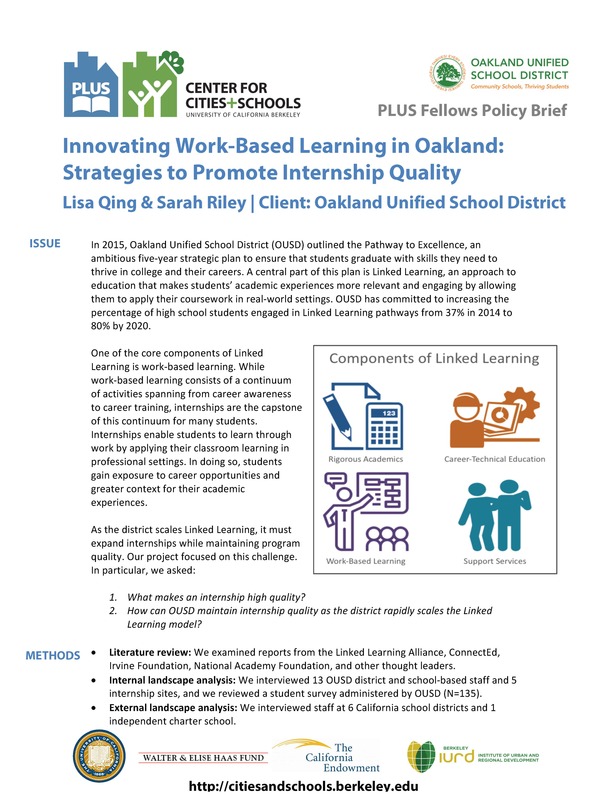 While work-based learning, exemplified by Oakland Unified School District’s (OUSD) Linked Learning program is part of a broader, statewide initiative to ensure students’ transition from school to work. 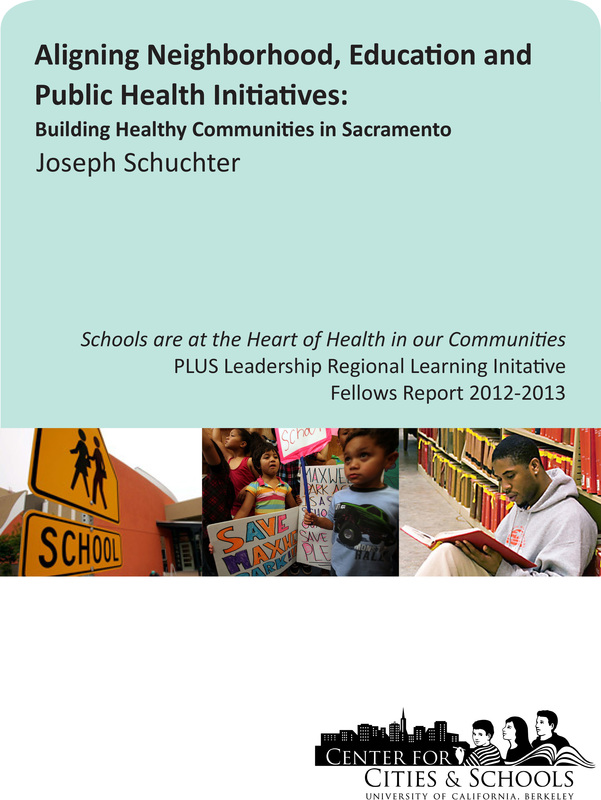 With the focus of coordinating community activities into school sites, this report regards cultivating joint use, after-school programs, school site plan integration and collaborative school study programs as potential methods. 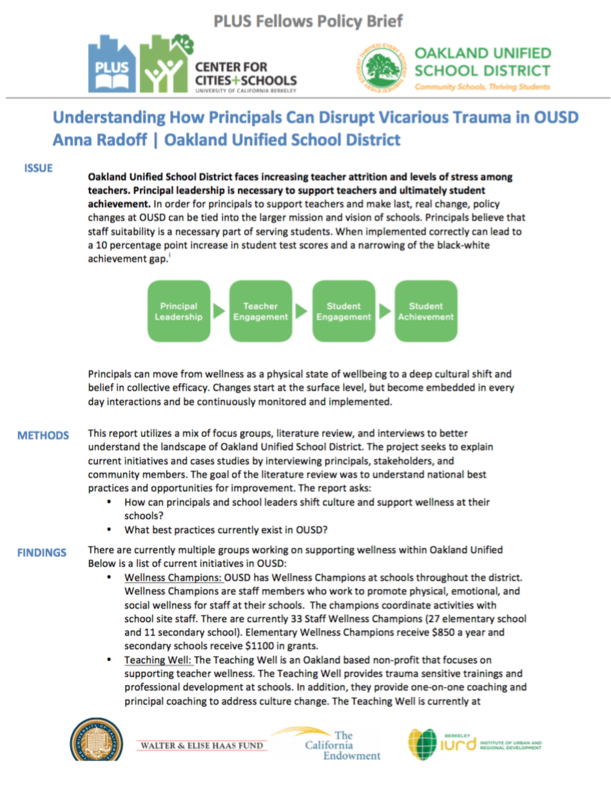 The applications of a wide swath of student and school data are quite valuable, but realistic timelines and cross-organizational coordination are necessary to improve data effectiveness. 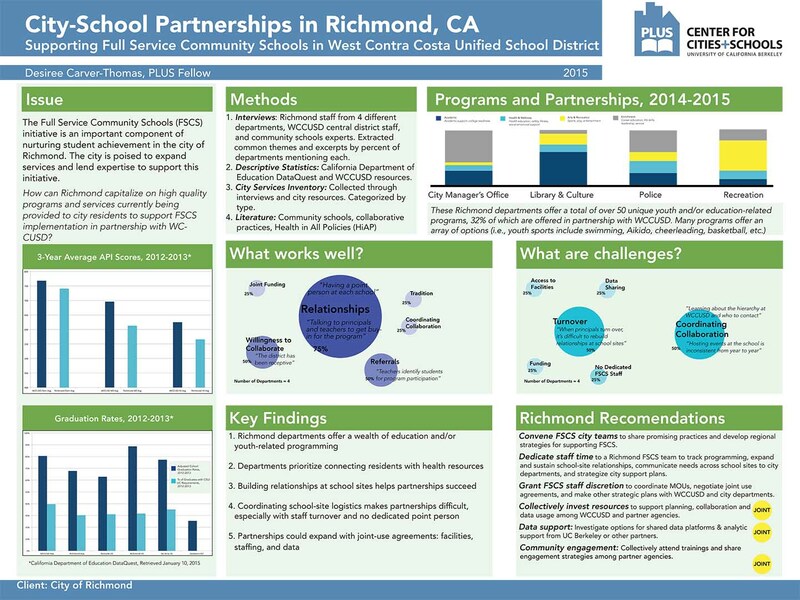 Nearly half of all West Contra Costa Unified School District (WCCUSD) schools are located in the City of Richmond and many Richmond students benefit immensely from the kinds of services offered in a community school. 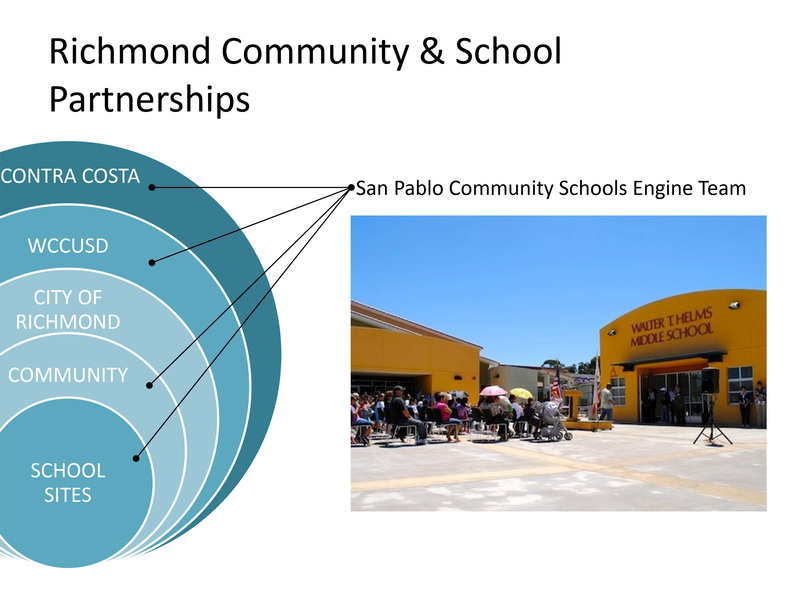 Now is an especially urgent time for high quality community schools implementation given the Richmond Promise, Local Control Funding Formula, and WCCUSD community school policies. 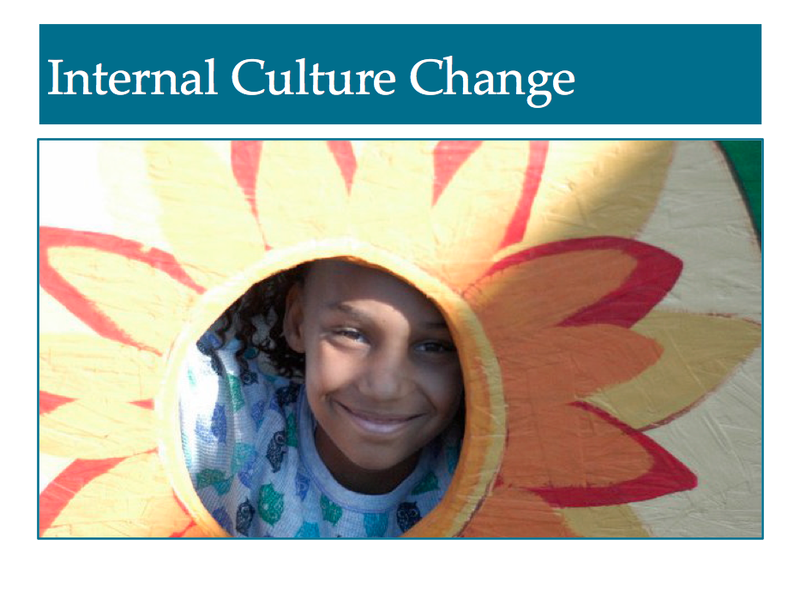 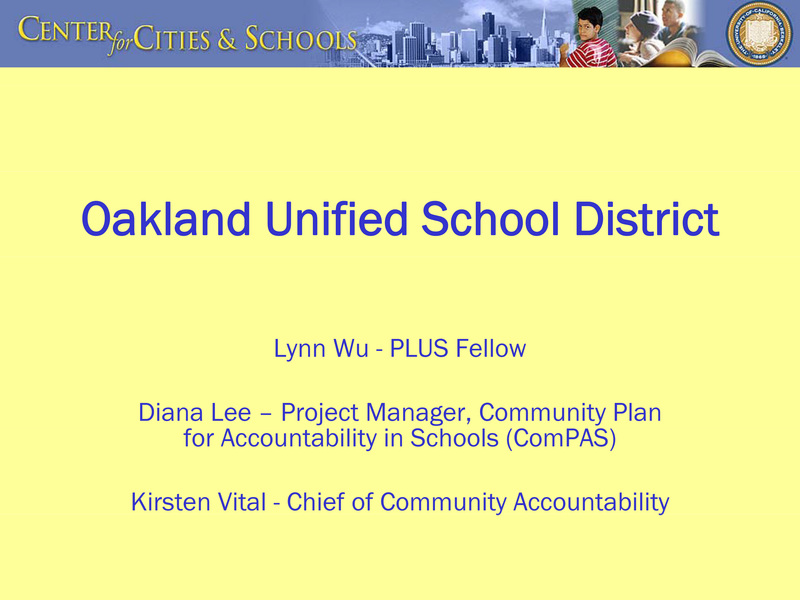 1) What is the current implementation status of the WCCUSD community schools initiative? 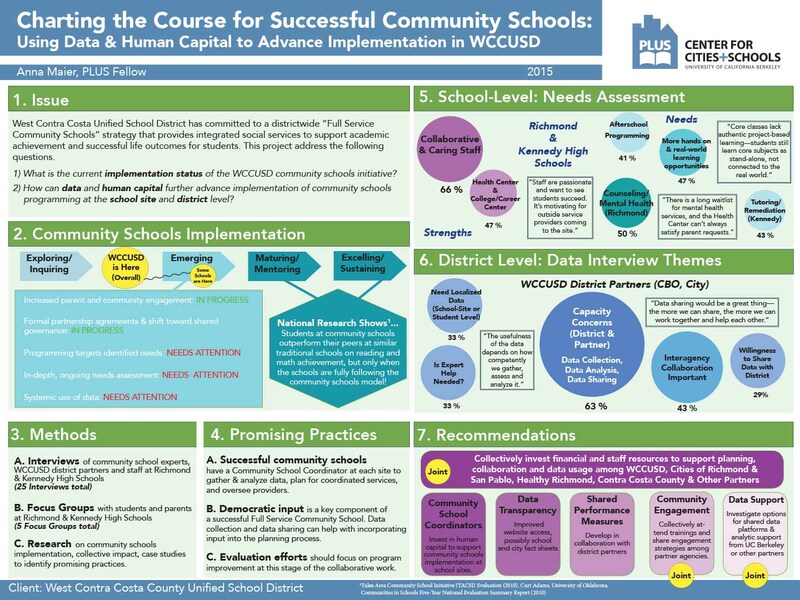 2) How can data and human capital advance implementation of community schools programming at the school site and district level? 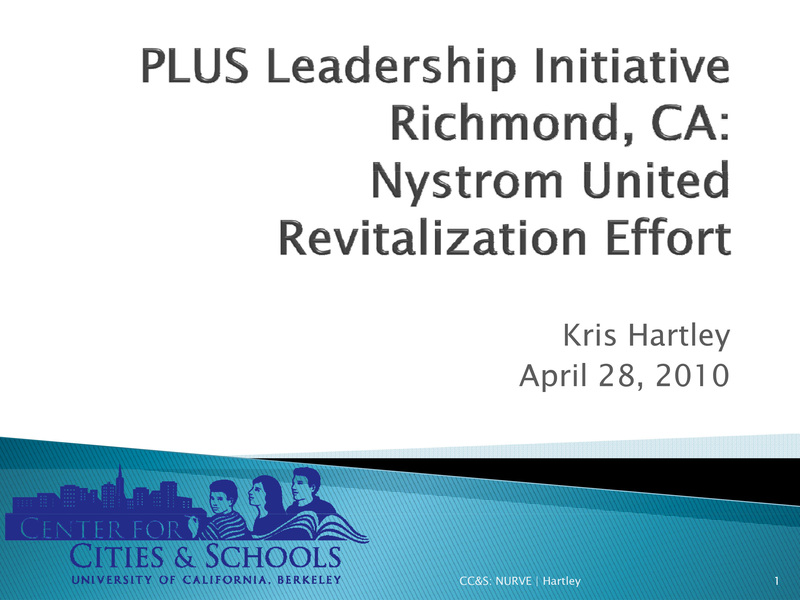 With the 2013 introduction of the Local Control Funding Formula (LCFF), the West Contra Costa School District, Healthy Richmond, the City of Richmond, and other stakeholders have been strategizing around how the LCFF can benefit underserved students through the implementation of a Full Service Community School model (FSCS). 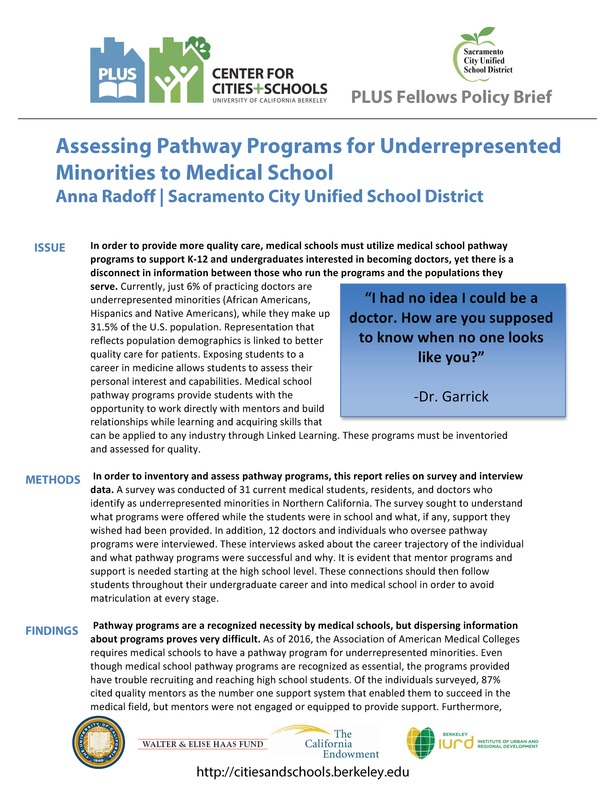 This project aims to investigate how best to align implementation methods. 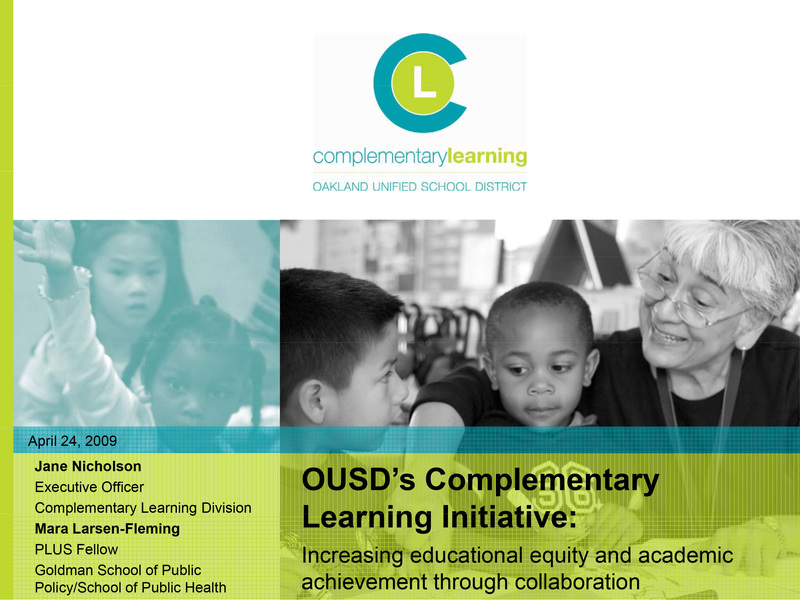 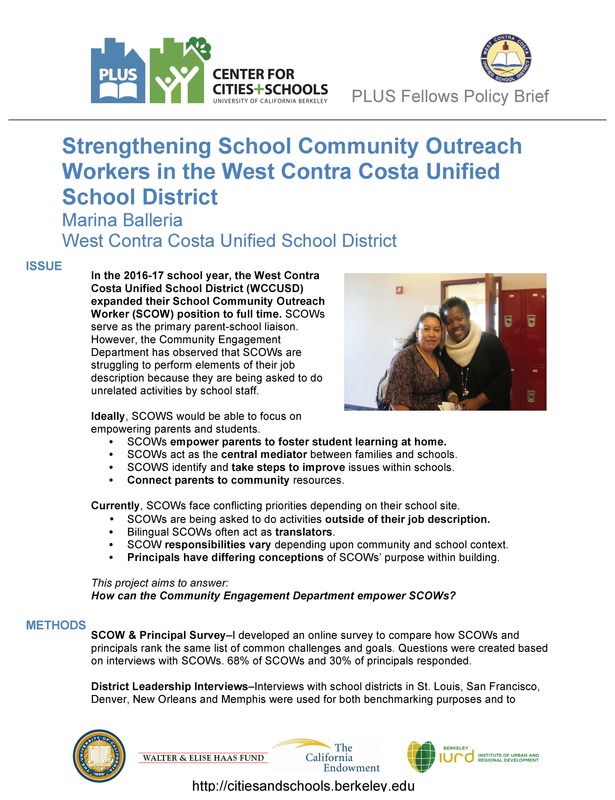 To strategically plan for the implementation of a full-service commuunity schools initiative, this project sought to identify existing programs at school sites in WCCUSD and analyze how the distribution of services aligns with local needs. The full-service community schools approach is a district-wide priority that aims to better coordinate and align public and private partnerships and resources to meet the comprehensive needs of students and create equitable conditions to promote community health. 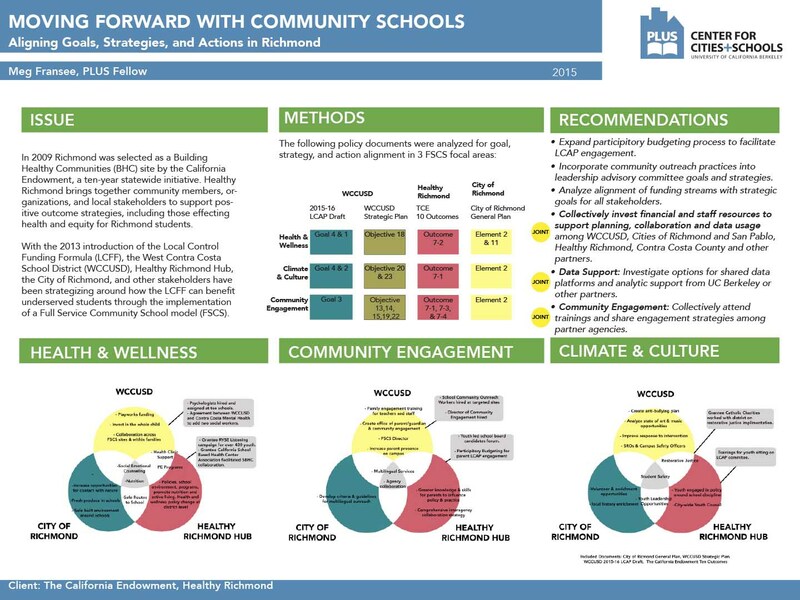 This report focuses in particular on the Richmond Health Equity Partnership for developing a district-wide FSCS strategy. 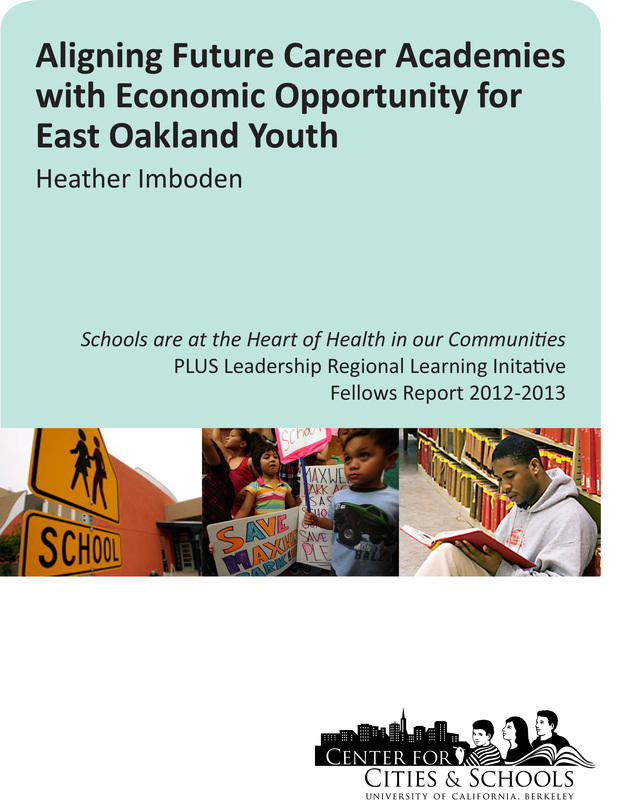 The Healthy Richmond Hub project can better meet the needs of young people by aligning community school and vision strategies with parent networks and school-based health centers as anchors. 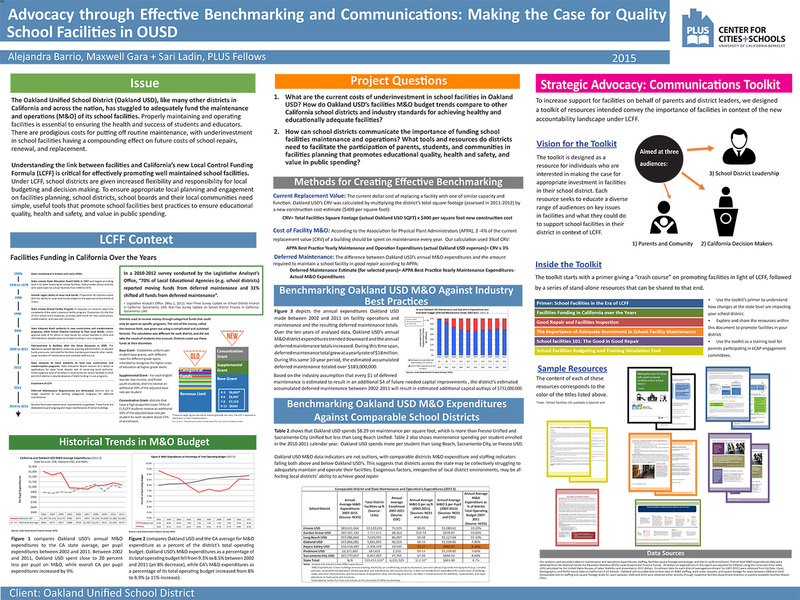 In order to build a "safe, diverse and thriving place" with full services, the community feedback repository should be institutionalized, stakeholder involvement should be coordinated and metrics for measuring the strategy's effectiveness should be devised. 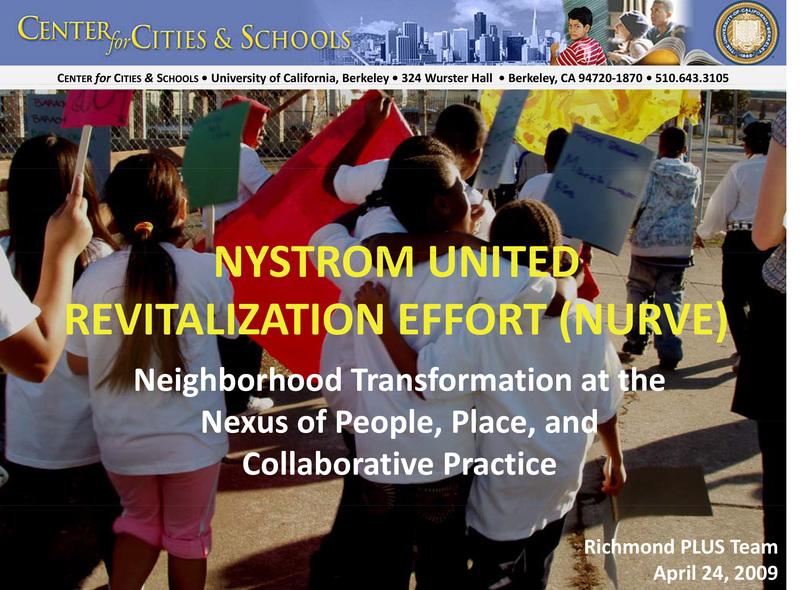 This project seeks to identify how to engage community members in the Nystrom United Revitalization Effort and implement collaboration and accountability structures across stakeholders. 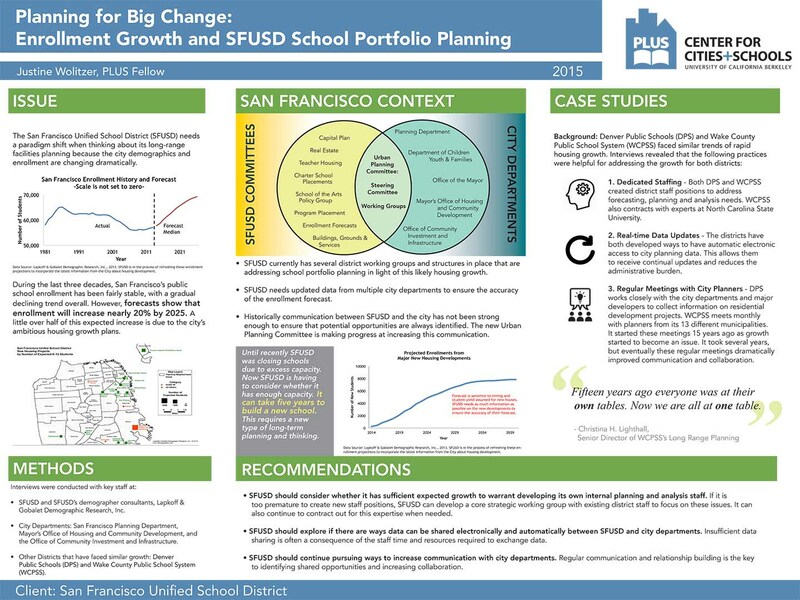 The San Francisco Unified School District (SFUSD) needs to re-evaluate their long-range facilities planning strategy because city demographics and enrollment are changing dramatically. 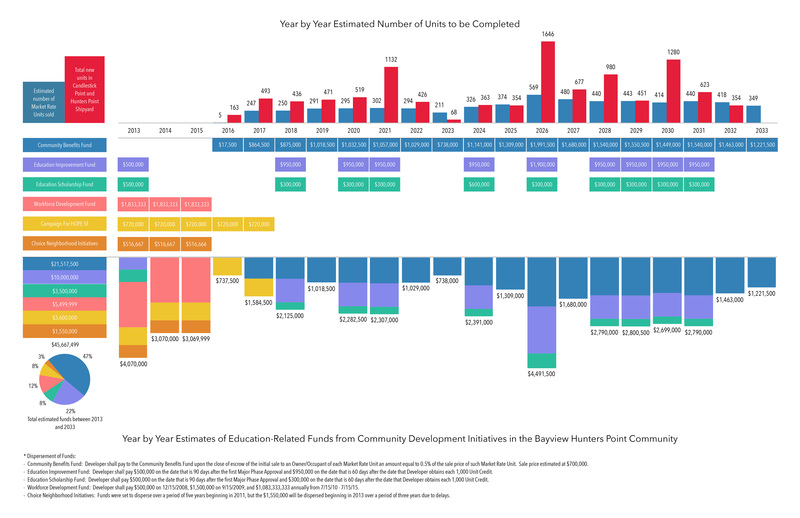 This is a result of ambitious housing growth plans, which contribute to a forecasted growth in enrollment by nearly 20% by 2025. 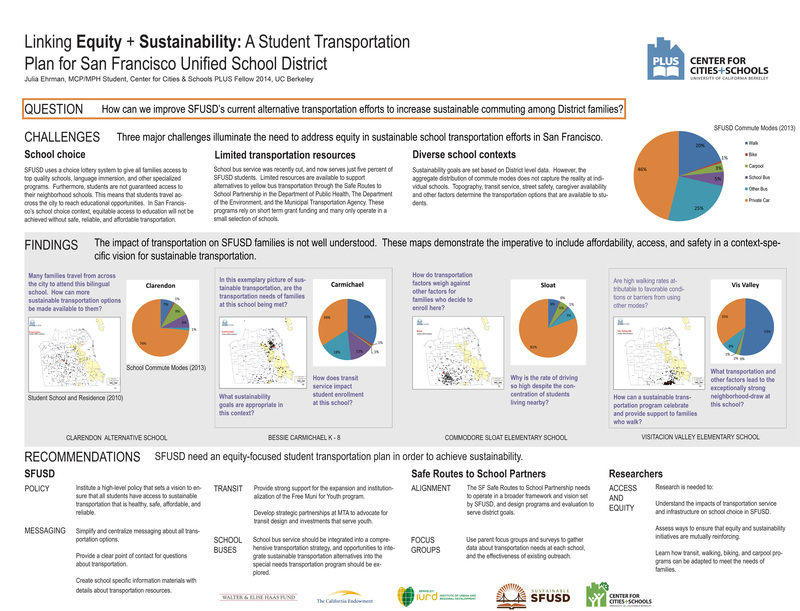 SFUSD provides school bus service to a small number of students, but the majority of SFUSD students rely on other transportation modes. 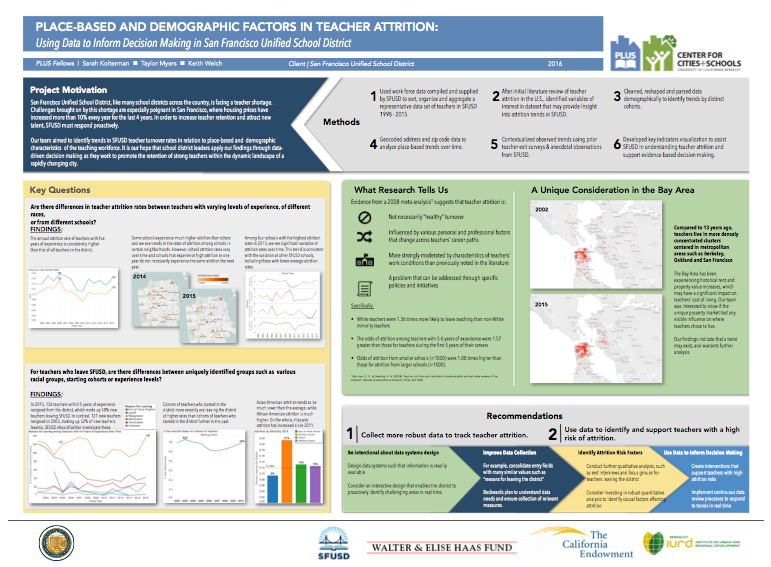 Many students face excessively long or unsafe commutes, while others rely on private vehicles because alternatives are insufficient for busy lifestyles. 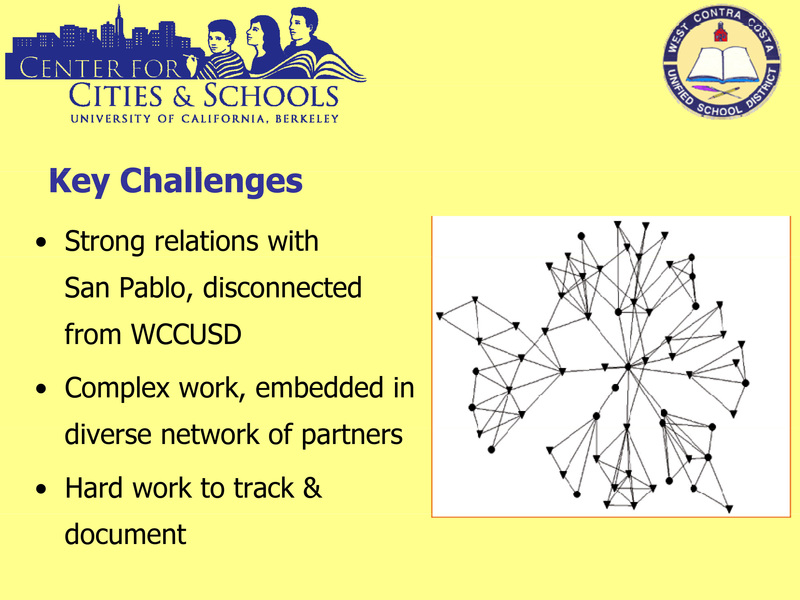 The complex school assignment system, diverse school contexts and limited resources create complex transportation challenges. 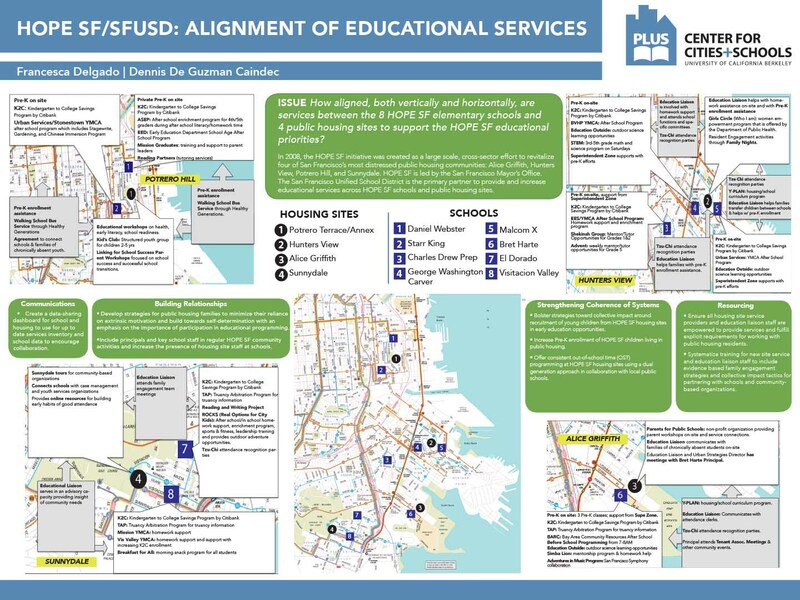 The San Francisco Unified School District (SFUSD) is the primary HOPE SF partner to address educational programs and other learning opportunities. 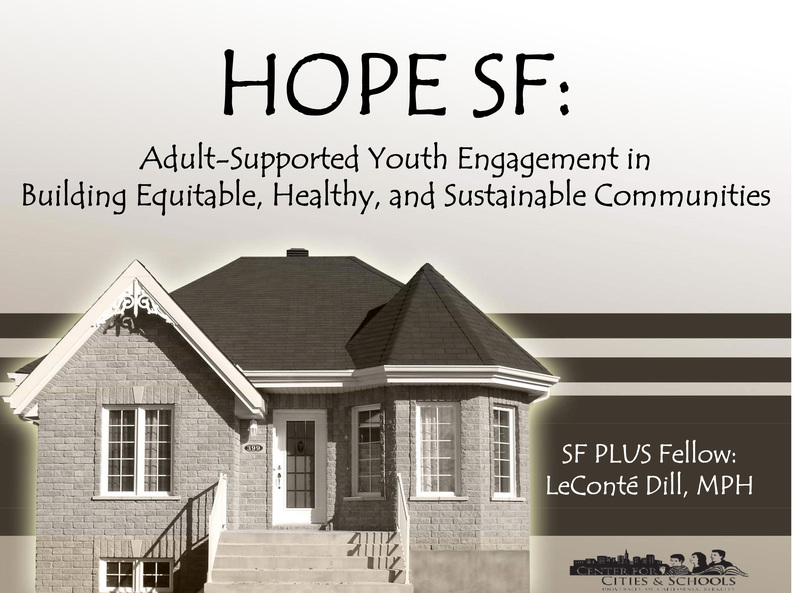 In particular, HOPE SF and SFUSD have partnered to provide and increase access to dual generational education services across the eight HOPE SF public elementary schools and four public housing sites. 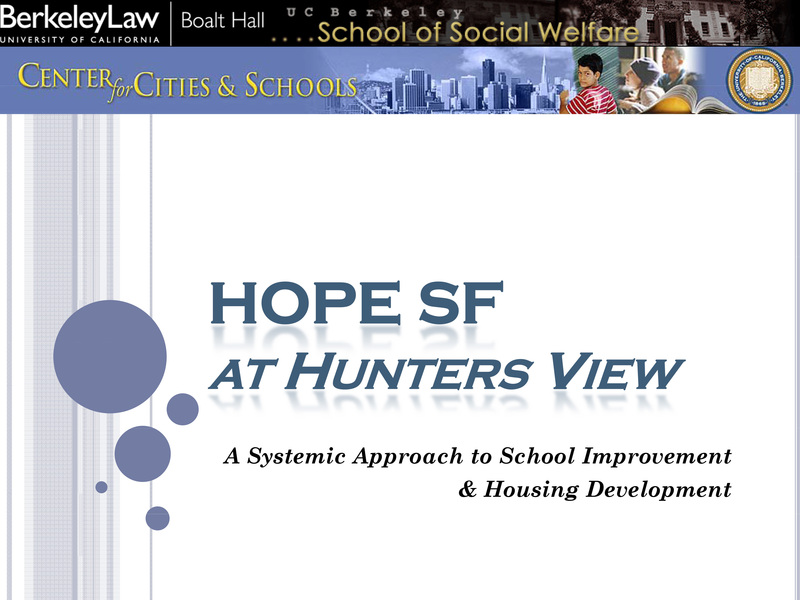 But how aligned, both vertically & horizontally, are services between the 8 HOPE SF elementary schools and 4 public housing sites to support the HOPE SF educational priorities? 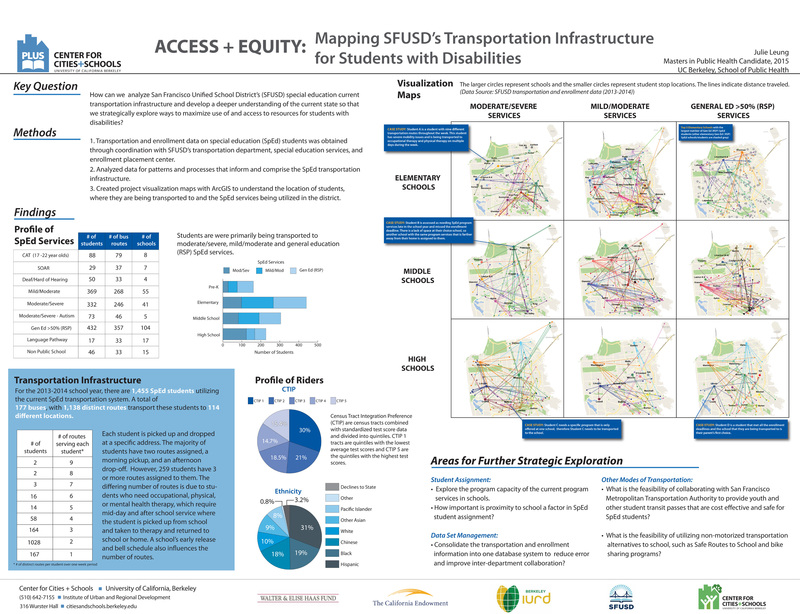 Using data from SFUSD's transportation department, special education services and enrollment placement center, project visualization maps were created using GIS to understand the location of students and services within the district. 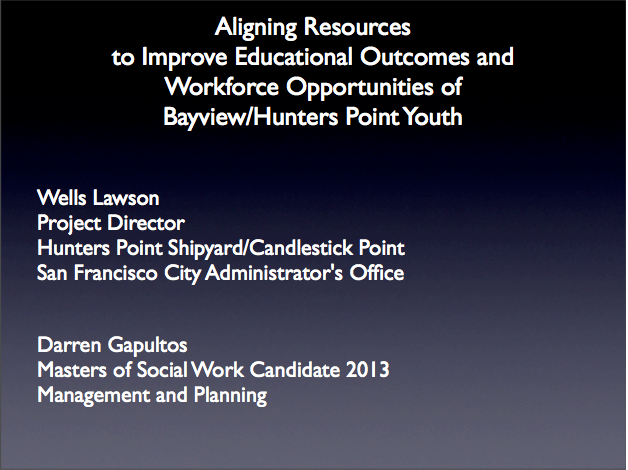 Important findings are elaborated upon. 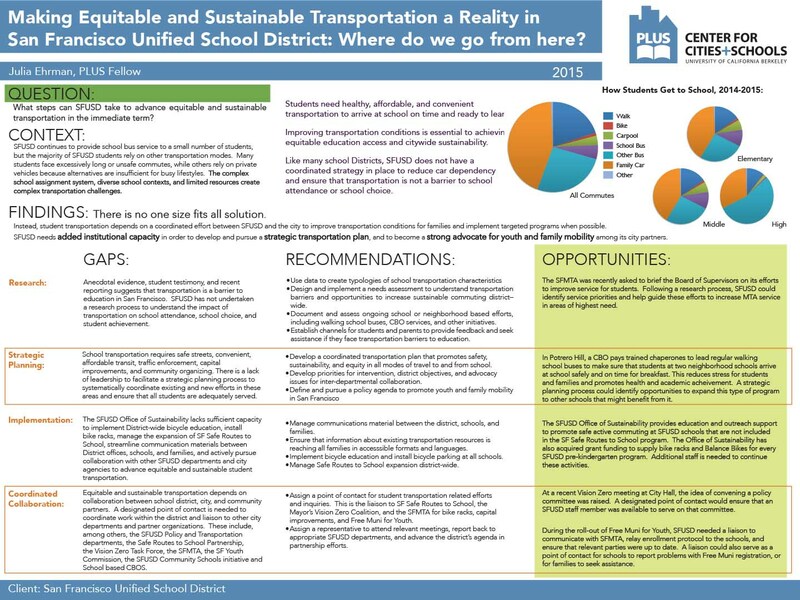 In San Francisco, three factors-school choice, limited transportation resources, and diverse school contexts-pose significant challenges to student transportation, and illuminate the need to include affordability, access, and safety in a context-specific sustainable transportation plan. 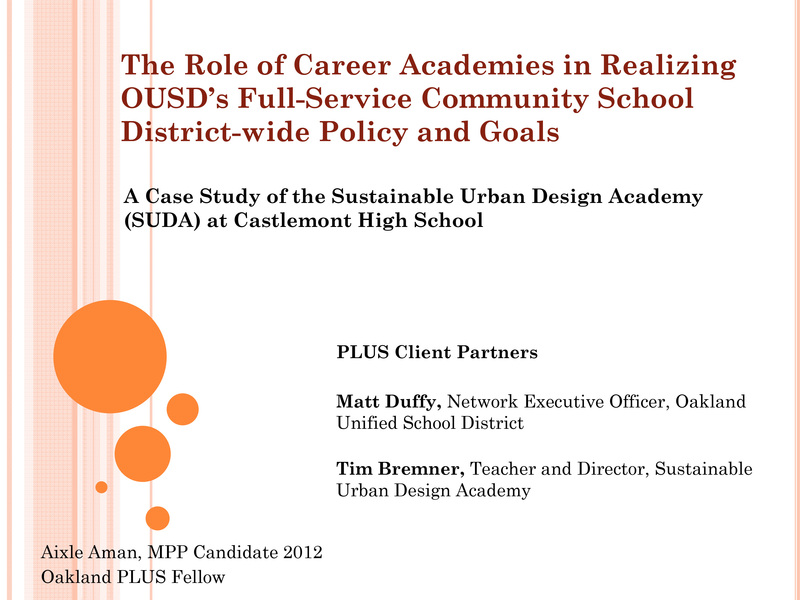 This paper implicates the SFUSD as the entity responsible for linking transportation equity and sustainability for its students. 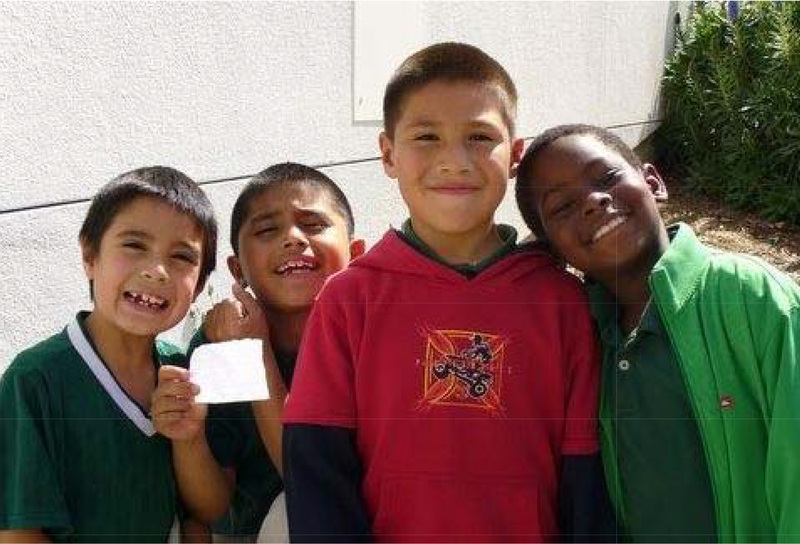 Public schools offer incredible potential for diverse uses by local community groups and organizations. 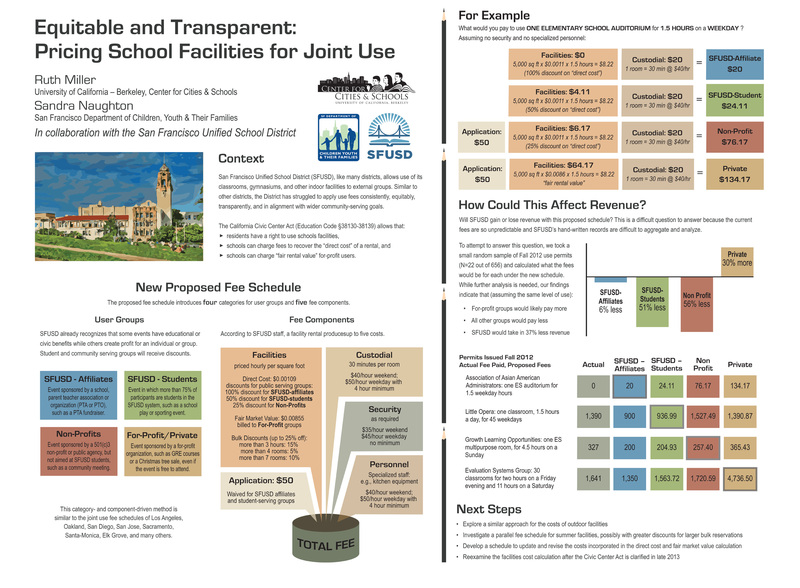 This presentation gives an overview of some of the challenges and potential benefits of creating municipal joint use policy. 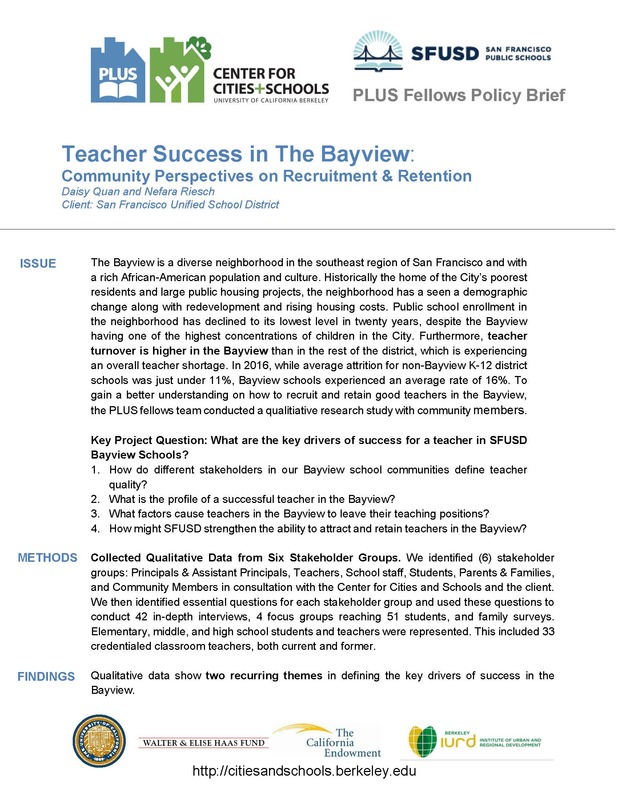 2008 Joint Use School partnerships in California: How Do Different Housing and How Do Different Housing and Redevelopment Policies in San Francisco Support or Impact SFUSD Families and Schools? 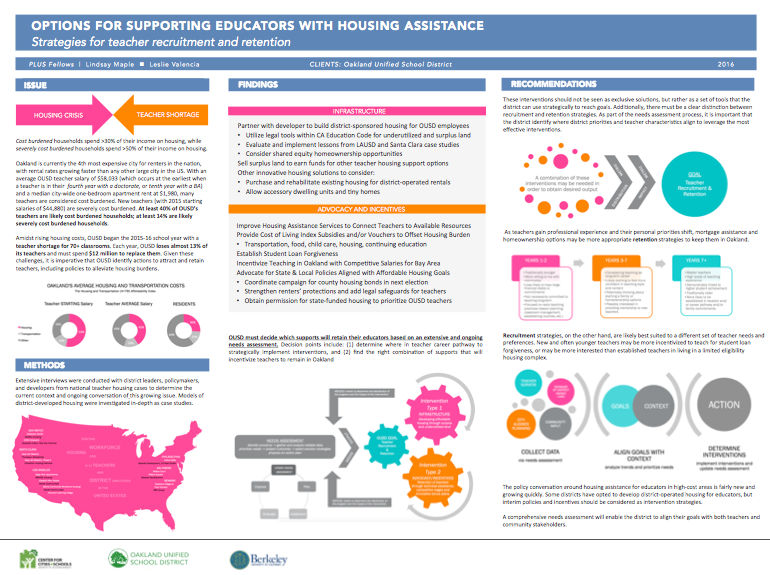 Considering the relationship between housing and education, this presentation recommends that long-term facilities planning, a joint media campaign involving housing and education policy stakeholders, and further development of the Healthy Development Measurement Tool. 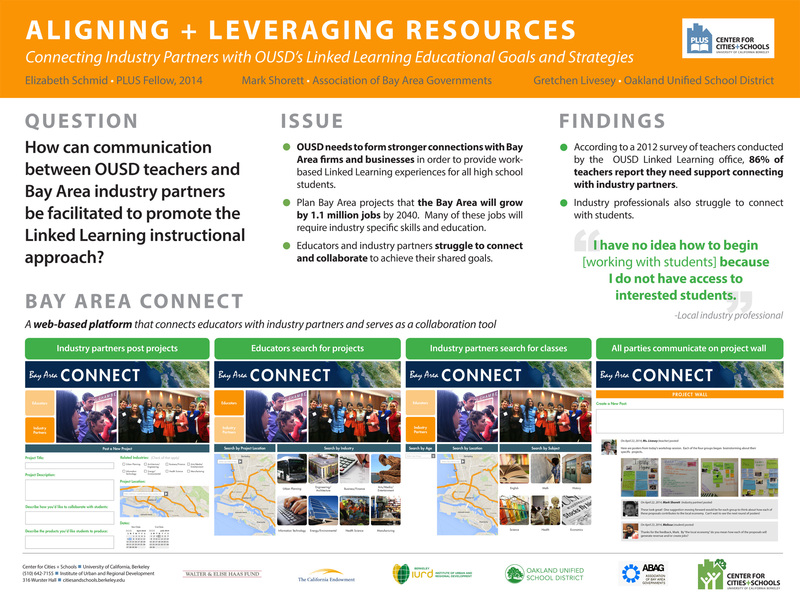 Greater information and knowledge sharing between WCCUSD and local government, through electronic attendance tracking and linked learning partnerships, would greatly improve the ability to connect land use and education policy. 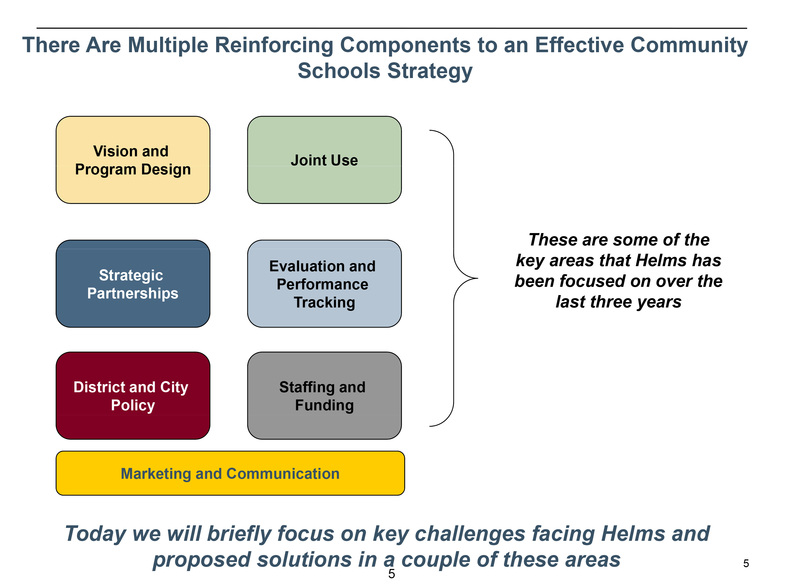 By forming strategic partnerships, encouraging joint use and integrating district and city policy, the Helms Community School has improved test scores, experienced high rates of attendance and essentially blurred the lines between home and school. 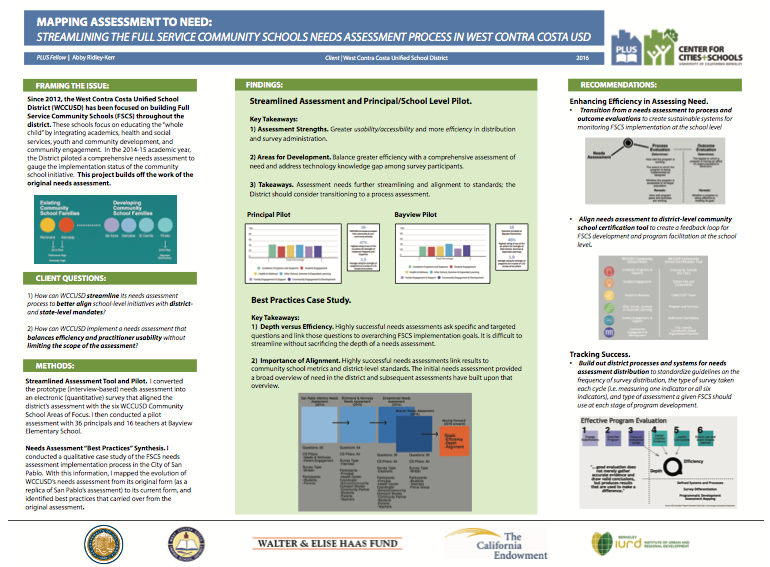 This presentation recommends collaborating with district health centers and after school programs, identifying gaps within the district's data needs and establishing a longitudinal evaluation plan. 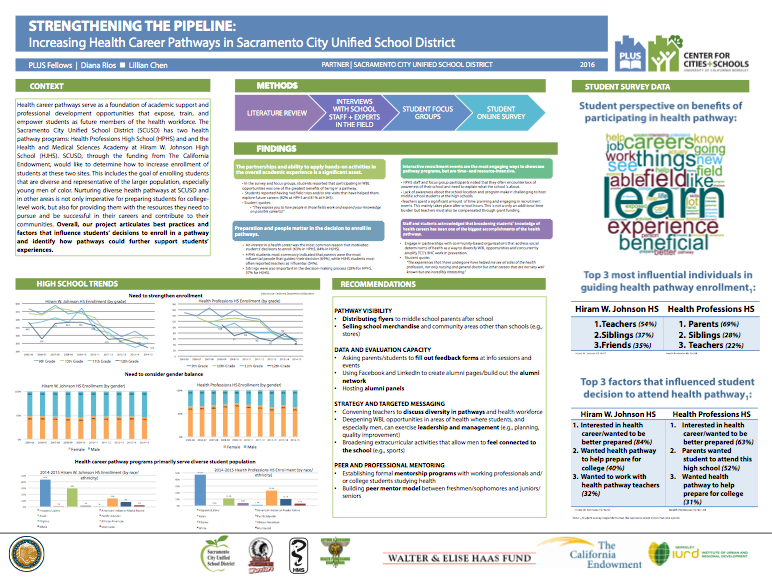 Health career pathway programs are a natural linkage between Sacramento City Unified School District's (SCUSD) expansion of LinkedLearning initiatives and the California Endowment's (TCE) focus on health. 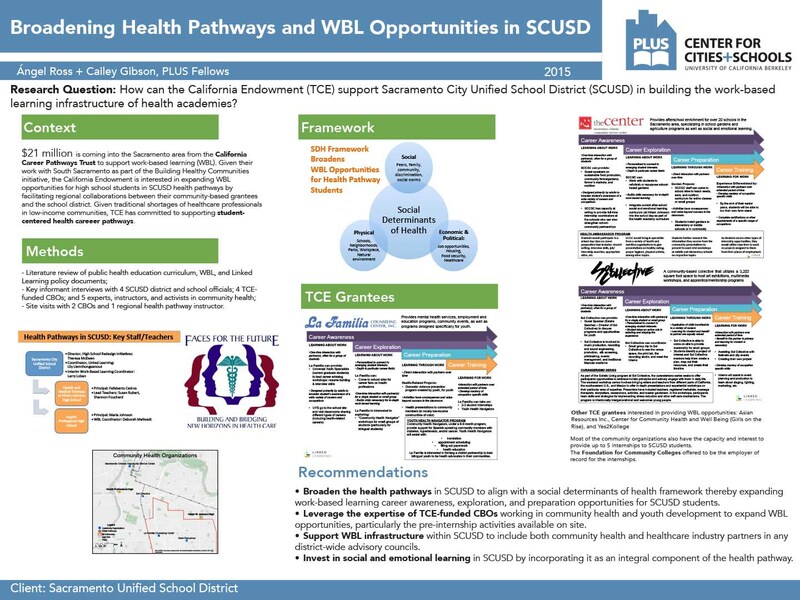 This project aims to frame this alignment and articulate how TCE can leverage grantees' expertise to best support student-centered health pathways and work-based learning in SCUSD. 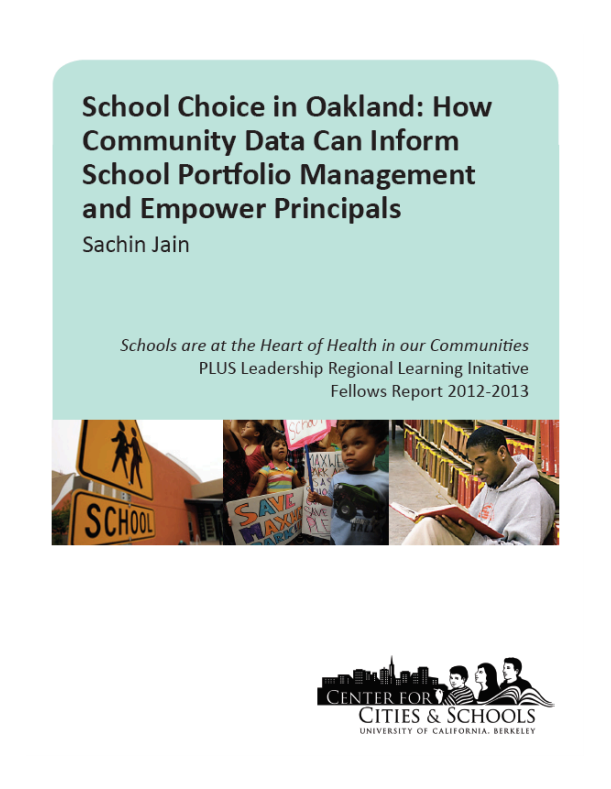 Using a range of research methods, this report examines broadly the alignment of the full portfolio of BHC grantees and in particular the interface between community-based organizations and schools. 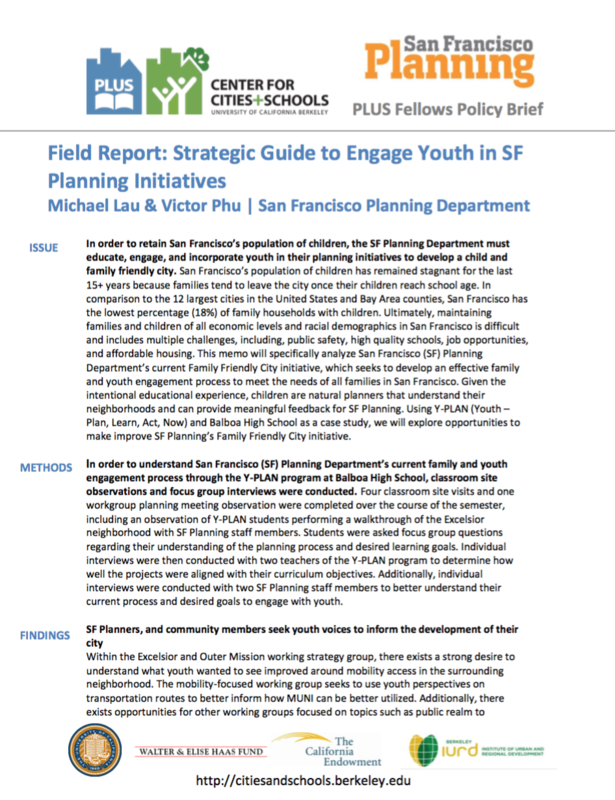 It finds that the majority of grantees – two thirds – share some youth development objective. 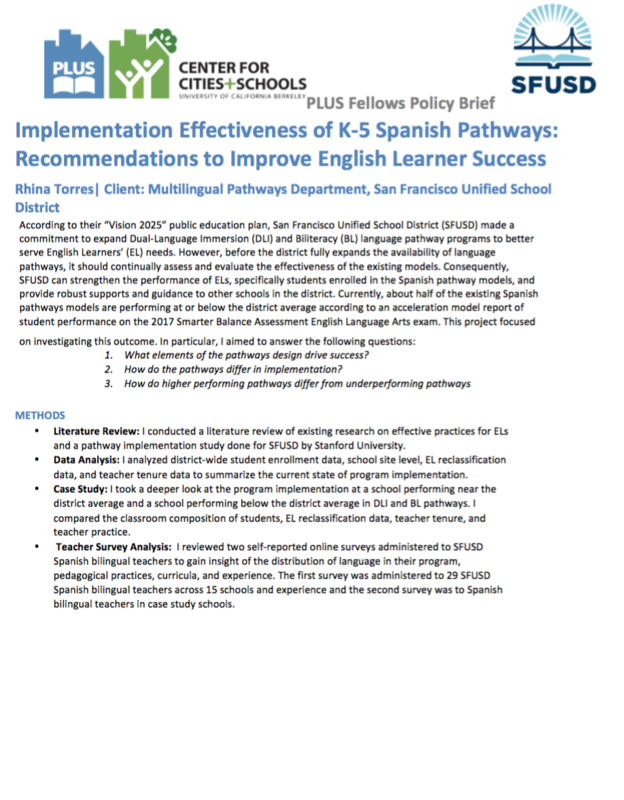 In order to improve student learning in the BUSD, this research recommends stronger district-level support, qualified managers at the school level, more universal training for staff and collaboration across schools and data systems. 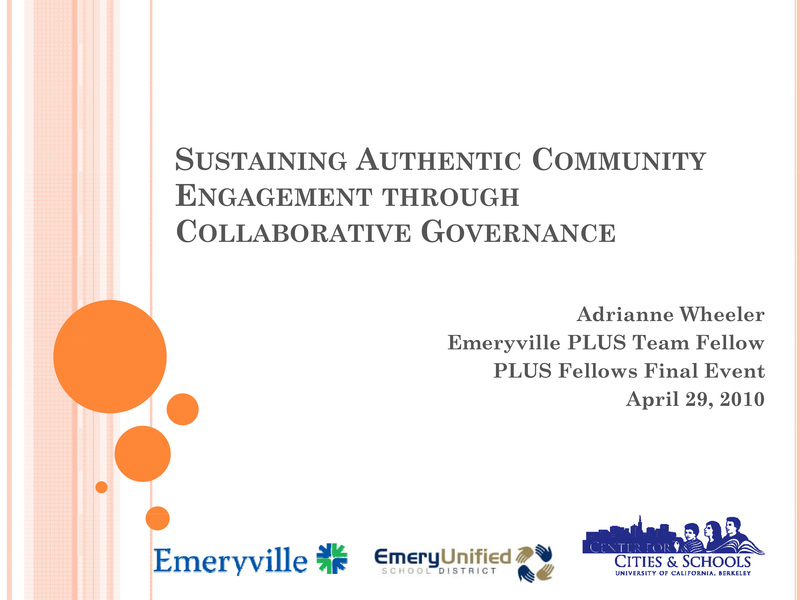 In order to eliminate the racial predictability of low performance, this presentation identifies cultivating underrepresented groups for leadership roles and designing a process through which new group members can be assimilated into the common culture. 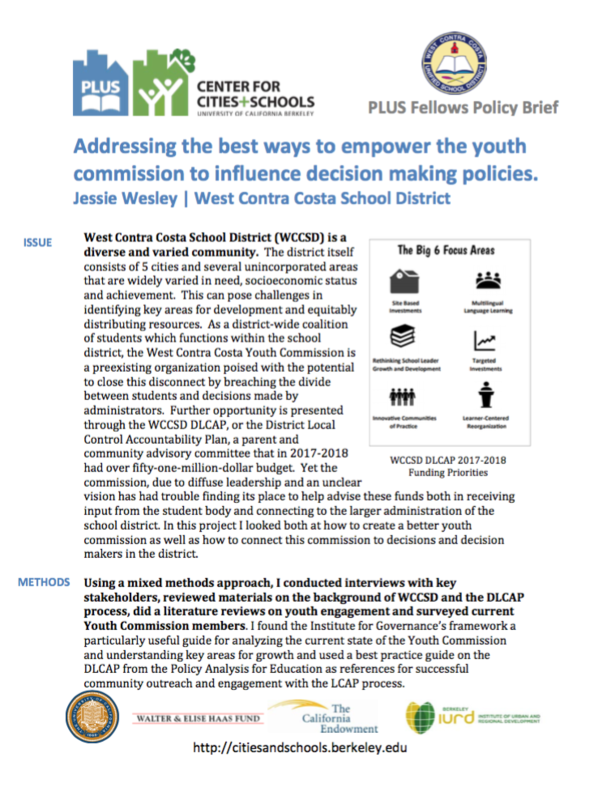 By reinvigorating the Youth Commission and collaborating with non-city agencies, youth engagement with and benefit from schools will improve. 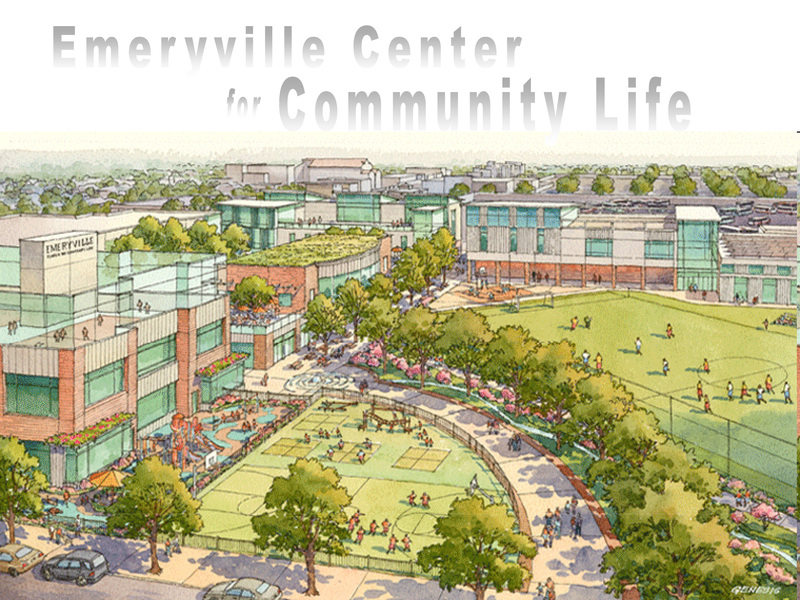 This presentation explores the most advantageous government models for the Emeryville Center for Community Life.